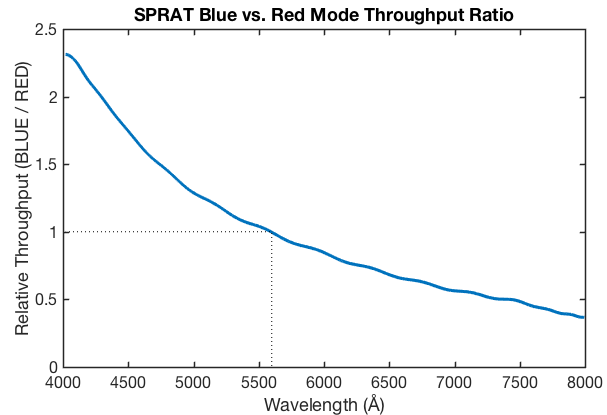 SPRAT (SPectrograph for the Rapid Acquisition of Transients) is a low resolution, high throughput spectrograph. It employs a VPH grating and prism ("grism") assembly to give a straight-optical path. The grism and slit are removed from the beam for acquisition and then placed in the beam for spectroscopy. SPRAT was fitted to the telescope at the start of September 2014 and is in routine use, available to all observers. The adjustable slit is set fairly wide at 1.8arcsec yielding a resolution of approximately R=350 (18Å). Camera: Andor iDus 420 Series, 26.6 x 6.6 mm/1024 x 255 pixel CCD. Approximate sensitivity for one photon per second per angstrom at 5500 Angstroms is V=16.5. An exposure time calculator is available here . Field of view in imaging (acquisition) mode 7.5 x 1.9 arcmin. Wavelength Range 4000 – 8000 Angstroms. Order blocking filter cuts out all light below 4000 Angstroms. Slit width 1.8 arcseconds, giving a resolution of 18 Angstroms (4 pixels), corresponding to R=350 at the centre of the spectrum. Spatial Pixel Scale 0.44 arcsec/pixel. Adjustable grating option. 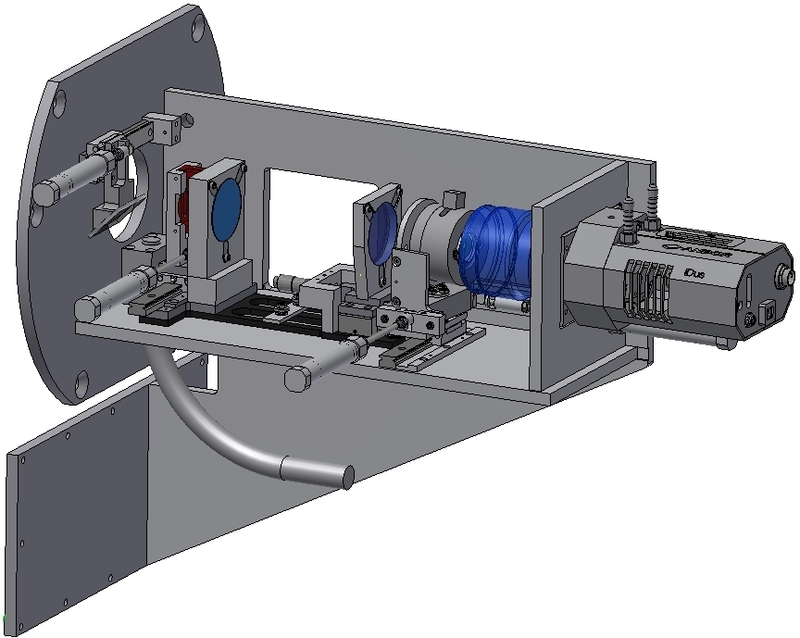 The grating may be set to two different configurations which are optimized for "blue" or "red" throughput. Our plan is to eventually provide absolute sensitivity curves for the two grating modes. In the meantime the example spectra below and the derived ratio plot show the difference in throughput between the two modes as a function of wavelength. The break-even point where the two modes offer equal efficiency is 5600Å. Switching between the modes takes < 10 seconds. Acquisition with SPRAT uses the same concepts of "WCS FIT" or "BRIGHTEST" as implemented for FRODOspec . However, unlike FRODOSpec, acquisition imaging is done on the same detector as used for spectroscopy. This eliminates a source of error in changing instruments, and allows us to acquire onto the (relatively) narrow slit. This means you must have accurate coordinates (better than 1 arcsec) for your targets. Coordinate errors in large catalogues frequently exceed this, especially for moderate proper motion stars. We strongly recommend obtaining your own astrometry from a recent image wherever possible. The acquisition process moves the target onto a "magic pixel" on the SPRAT CCD. The location of this pixel is maintained by operations staff and may vary slightly over time, though it should be close to 480,180. Targets should thus be located on or very close to this pixel in the final acquisition image obtained just before spectra are acquired. Note that all acquisition images are made available to users. On a well-populated field the acquisition process usually takes 4-5 minutes. This includes time to take an image of the slit after acquisition, before the first spectral data are acquired. Though relatively complicated, most users have no need to get involved in the acquisition process beyond providing accurate target coordinates. The "Wizard for SPRAT" option in the phase2ui automatically creates the optimum observing sequence. NB: It is also possible to use IO:O to provide an acquisition image instead of SPRAT. In such a case the LT will adjust the telescope to place the target on the "magic pixel" in IO:O's field of view. Then it moves the science fold to select SPRAT and put the target on the slit. See "Using IO:O as the Acquisition Instrument" on the main SPRAT page for full details, and the implications of setting this up. An adaptation of the FRODOSpec pipeline is being used to provide reduced, wavelength and flux calibrated 1d and 2d spectra to users. Both sky-subtracted and non-sky-subtracted versions are available. Access to the raw data is also provided. The intent of the automated pipeline is to provide science-ready data products for isolated, point source targets. Extended or crowded sources may be expected to require further input from the user. All data pass through the "Level 1" pipeline to remove low level instrumental signatures such as bias, dark and flat field. Acquisition frames, slit images and arcs are treated as 2D images, reduced through the L1 pipeline and distributed as simple FITS image files like any other imager. The spectral data are passed through a second "Level 2" pipeline to perform source extraction, sky subtraction and wavelength and flux calibration. A note on flux calibration: We make absolutely no claim that the automated pipeline provides precision spectrophotometry. The intention of the flux calibrated data products is exclusively to remove the instrument's own spectral response and provide a good representation of the true continuum colour. The pipeline makes no Telluric or airmass corrections and does not derive a nghtly atmospheric extinction profile. The instrumental spectral response used by the pipeline is only recalibrated following hardware changes or as required. It is not recalibrated frequently to trace the steady degradation of the mirror surface (LT Tech. Note 1: Telescope and IO:O Throughput) so can be expected to show significant drift (∼0.1 mag/yr) on long time-scales. Observers requiring the best spectrophotometry will need to schedule their own calibration standards. Filenames follow the usual LT conventions and are in the form "v_e_20170216_M_N_0_R.fits", where M and N uniquely identify the observation within the night and R is a status flag defining what level of processing has been applied. 1 Level 1 reduced image. This is the final product for arc, slit and acquistion images. The FITS contains a single primary array. 2 Level 2 reduced data products. This is a multi-extension FITS containing a primary image array that is the level 1 reduced CCD frame and up to five FITS extensions of derived products. If the pipeline was unable to successfully process the spectrum this *_2.fits file may not be created. 0 Raw data as read from the detector array. Level 2 data products (filenames ending _2.fits) are multi-extension FITS files containing a primary image array for the level 1 reduced CCD frame and up to five FITS extensions of derived products. 0 L1_IMAGE The "Level 1" reduced image. Basic CCD reductions have been applied but no spectral processing. 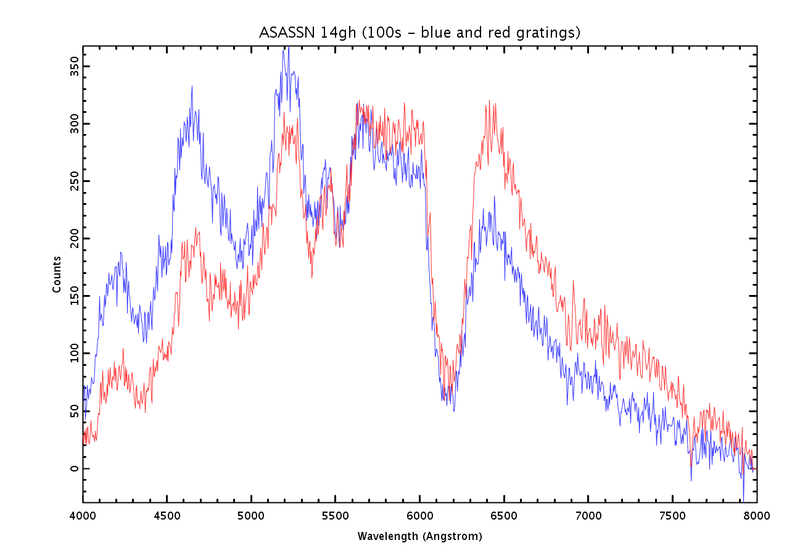 1 LSS_NONSS A wavelength calibrated long-slit image. No sky subtraction has been applied. A geometric distortion map has been applied to align the image array axes to spatial and spectral coordinates respectively. The wavelength axis has been resampled and linearized. This extension is most useful to observers of extended or binary targets since a wavelength calibrated spectrum of any point in the slit may be obtained simply as an indivdual pixel row. 2 SPEC_NONSS Automated 1D extraction of the acquired target with wavelength calibration applied, but not sky subtraction. Extraction assumes a point source so may not be appropriate for extended, merged or crowded targets. This extension may not exist if the pipeline was unable to detect an isolated point source at the expected target location on the slit. 3 SPEC_SS Automated 1D extraction of the acquired target with wavelength calibration and automated sky subtraction applied. Sky subtraction assumes the darkest region of the slit is clean sky which may not be true for a target embedded in a larger nebulosity such as a supernova in a nearby host galaxy. See also description of SPEC_NONSS above. 4 NORMFLUX Automated, wavelength calibrated, sky subtracted, 1D extraction, converted to normalised flux. That is, the instrumental spectral response has been removed to yield the target's correct relative flux as a function of wavelength. Units are normalised to average unity in the region 5000–6000Å. Always exists if extension SPEC_SS exists. 5 FLUX Automated, wavelength calibrated, sky subtracted, 1D extraction, flux calibrated in erg s-1 cm-2 Å-1. 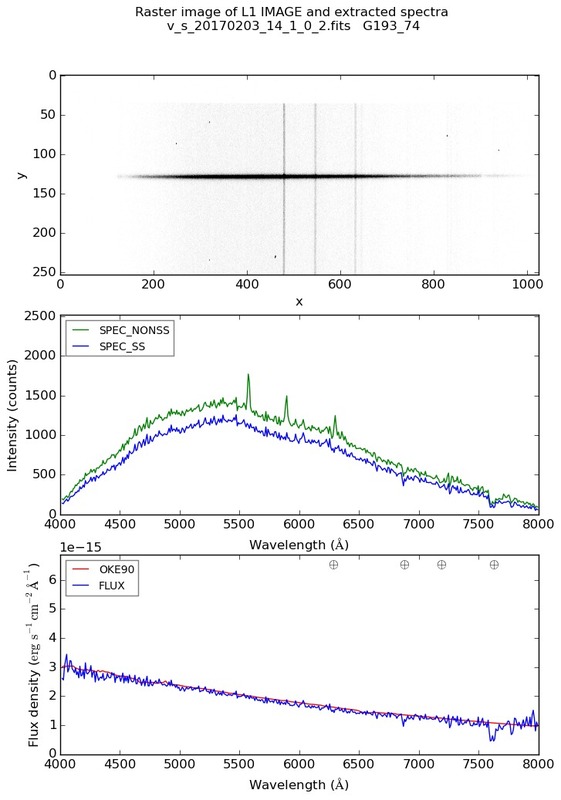 The absolute flux calibration is based on photometry of the final acquisition image, not of the spectrum itself. There are therefore no slit losses and approximately the same result would be extracted in very good or very poor seeing. This may have implications for extended sources where it is unclear how the aperture photometry has affected flux extraction in the image. May also be wrong in patchy cloud where extinction changes between acquisition and spectrum. This extension will not exist if the pipeline was unable to detect an isolated point source at the expected target location in the acquisition frame, if the image has unreliable photometry for any reason (e.g., saturated CCD) or if a native SPRAT acquisition image does not exist (e.g., acquisition was performed using IO:O). Shown is an example automated reduction for a 180sec integration of the V=15.7 standard star G193-74. Preview plots in this form are available for all observations from the LT data archive. The top panel shows the basic CCD image before any spectral processing. This is the "Level 1" data product and found in the FITS primary image. The centre panel shows FITS extensions 2 (SPEC_NONSS) and 3 (SPEC_SS), extractions of the target object presented in instrumental counts with and without sky subtraction. 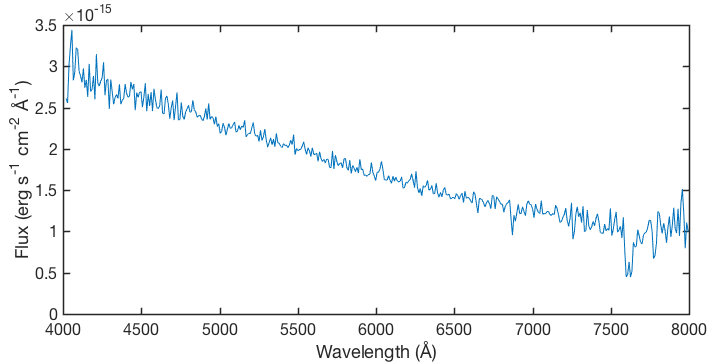 In the green SPEC_NONSS trace, sky emission lines are visible. The bottom panel shows FITS extension 5 (FLUX), the final flux calibrated, wavelength calibrated spectrum in units of erg s-1 cm-2 Å-1. The pipeline provides no correction for Telluric absorption which is visible towards the red end of the spectrum. For comparison the data of Oke 1990 (AJ, 99, 1621, 1990) have been overplotted. A frame extraction can be achieved with the -savefits parameter. 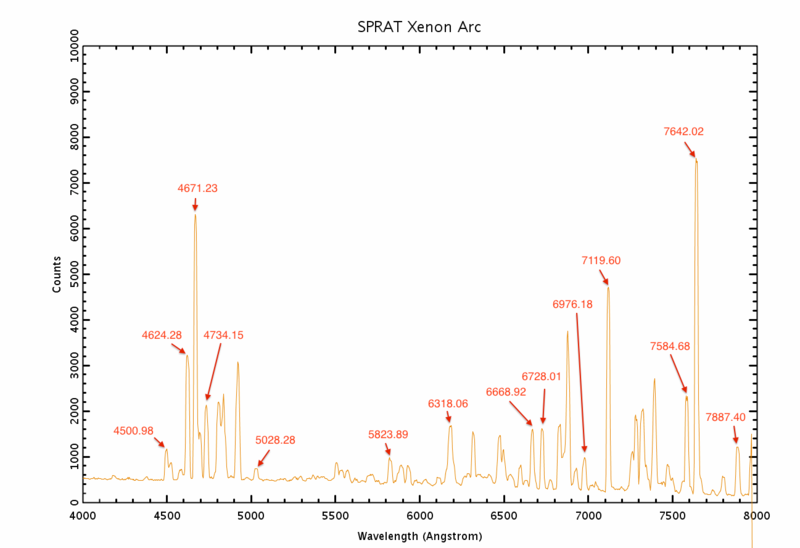 We recommend that all users include a Xenon arc observation at the end of their group (see the SPRAT Phase2 guidelines for details). This arc will be used by the pipeline to wavelength calibrate spectra extracted from your data. If you do not include an arc in your observing sequence the pipeline will automatically use the best matching arc available to it from the data archive. A simple arc map is shown to the right. Guidelines on how to prepare observations are given in the Phase 2 web pages. Note in particular the instrument-specific User Interface Instructions. The phase 2 "Wizard" should always be used to prepare observations. Groups that can not be prepared with the wizard should be discussed with LT Phase 2 support. Note that LT staff do not routinely check observing groups, and that observing groups are potentially active as soon as they are submitted. Please do contact us if you have any questions about your observations. SPRAT can accept observation requests formatted in Remote Telescope Markup Language (RTML), which allows you to automatically trigger certain observations from within your own autonomous software. We provide a command-line-based utility which can format RTML packets for you, making it easy to integrate observing requests into a shell script or other data processing pipeline. For some user cases it might also be easier for users to upload all their observing requests from the command line instead of using the Phase2UI. The RTML facility is available to all users who have TAG-awarded time allocations. Please contact us if this sounds of interest, and we will provide full user instructions. A single spectrophotometric standard observation is performed on any nights that are anticipated to offer photometric clarity. This provides routine monitoring of overall system throughput and stability and the exposures are available to all observers. A single standard observation is not sufficient for precision spectrophotometry and will not, for example, allow derivation of a night-specific atmospheric absorption. Users requiring a higher level of photometric or atmospheric calibration must schedule their required standards from their own time allocation. Users may wish to add a standard star observation to their SPRAT observing sequence so that their calibration observations are matched in time and airmass with the science data; see the SPRAT Phase2 guidelines for details on how to do this using the Sequence Builder. Links to tables of spectro-photometric standard stars are provided by ESO here, however it should be noted that very many of the common spectro-photometric standards are high proper motion stars and published catalogue coordinates are inadequate for slit acquisition. A selection of popular standards for which we maintain up to date coordinates is preconfigured in the phase2ui when you select "Add Target" in the phase2ui.